How does one get to this place? Where is it exactly? Do we have to call before and confirm or just walk in? 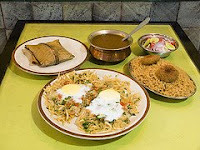 Samil very intresting to note this.Aftèr your lastblog i was looking forward to another discovery.Now that tou have been thère,done that do take me nèxt time around.Last when i was in delhi i did try to pick info on parsi joints from thère agiyari near Khan Market. I was wondering where to get parsi food in delhi,now that have moved from mumbai,Jimmy boy,britannia and my own home cooked ones by my wife. Infact i tried my hands on cooking the mútton palav and the salli ghost under the divine guidance of my late dear father in Law's recp.bòok(which i guess hê left for me knowing my love for everything parsi)and the able supervisiòn of Khushnoor my wife.The result was awesòme and súddenly i figured in my son's composition writings on "My father" with special ref like,hê is a very good Cook.Till the süch writings and special ref was limited only to mom. The way you showed me places around in mumbai let me have the pleasure in delhi only. Samil very intresting to note this.Aftèr your lastblog i was looking forward to another discovery.Now that you have been thère,done that do take me alòng nèxt time around.Last when i was in delhi i did try to pick info on parsi joints from thère agiyari near Khan Market. I was wondering where to get parsi food in delhi,now that have moved from mumbai,Jimmy boy,britannia and my own home cooked parsi delicacies of my wife. Infact i tried my hands on cooking the mútton palav and the salli ghost under the divine guidance of my late dear father in Law's recp.bòok(which i guess hê left for me knowing my love for everything parsi)and the able supervisiòn of Khushnoor my wife.The result was awesòme and súddenly i figured in my son's composition writings on "My father" with special ref like,hê is a very good Cook.Till then süch writings and special ref were limited only to mom. The way you showed me places around in mumbai let me have the pleasure in delhi also . people take pride in cooking some exotic foreign dish but not so with the traditional desi ones. Pure Nostalgia: I remmbrd abt my childhood days whn we went to the Sarosh Canteen, Ahmednagar to Have the Yummy, Mutton Pattis, Pastries, Egg Sandwitches, ice-creams, plain cakes, fresh bread and cream rolls. Ever since thn, have never had that lovely taste even in the most expensive and popular eat-outs. Hats off to Sarosh Canteen! We loved Sarosh, I hope its still around. Would love to go there someday. Hi, Is there a number where I can call and ask when we can drop in for lunch?